"He will not break the crushed reed, nor put out the smouldering wick till he has led the truth to victory: in his name the nations will put their hope." Before the reform of the General Roman Calendar today was the feast of St. Alexis. In the Middle Ages St. Alexis was extremely popular throughout the West. He was famous for his extraordinary self-denial. To what extent the life and Acts of this saint are historical, whether this "man of God," as he was and is called in the Orient, lived in the East or at Rome — these are questions we here must pass over. The story of St. Alexius, one of the most edifying in Christian hagiography, presents a glorious illustration of that Christian ideal of perfection which for Christ's sake embraces poverty and humiliations. Is it possible to be more heroic than to live for seventeen years under the steps in one's own house, to endure the wanton affronts of one's father's slaves, to remain as an unknown beggar to father, mother, and a bride still longing for her spouse? And for Alexius all this was motivated by an insurmountable love of Christ! Even supposing the legend to lack an historical kernel, it still would be marvelous to find a religion that could create such an ideal. The Breviary gives these details. Alexius belonged to a noble Roman family. Prompted by a special divine illumination and moved by an ardent love for Jesus Christ, he left his maiden bride upon their wedding day and began a pilgrimage to the more illustrious churches of Christendom. He had devoted seventeen years to this pilgrimage and was at Edessa, a Syrian city, when his holiness was revealed by a picture of the Blessed Virgin that uttered his name. He left the place and by boat arrived at the port of Rome. His father received him as a traveling stranger and he remained there seventeen years, living under the stairs of the house unrecognized by anyone. Only after his death were documents found giving his name, family, and a kind of autobiography. He died July 17, 417, during the pontificate of Pope Innocent I.
Patron: Of beggars and pilgrims. Symbols: A beggar or pilgrim holding a staircase (his emblem); asleep by the stairs, dirty water emptied on him; as a pilgrim with a staff and scrip; as a pilgrim, kneeling before the pope, to whom he gives a letter. Today would be a good time to reflect on poverty of spirit. We have brought nothing into the world, neither can we take anything out. Having food and clothing, let us be content. Those who wish to become rich will fall into temptation and into the snares of the devil because the love of money is the root of all evil. How powerful these words sound coming from the lips of St. Alexius, for he actually lived them in all their bitter implications. He left all and followed the Lord. Examine yourself on how detached you are from material things. Offer your rosary or a prayer that you will have the grace to be poor in spirit. 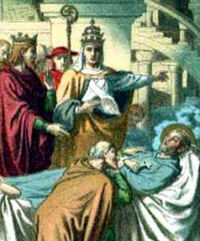 Learn more about St. Alexis here. On July 17, 1794, sixteen Carmelites caught up in the French Revolution were guillotined at the Place du Trône Renversé (now called Place de la Nation), in Paris. When the revolution started in 1789, a group of twenty-one discalced Carmelites lived in a monastery in Compiegne France, founded in 1641. The monastery was ordered closed in 1790 by the Revolutionary government, and the nuns were disbanded. Sixteen of the nuns were accused of living in a religious community in 1794. They were arrested on June 22 and imprisoned in a Visitation convent in Compiegne There they openly resumed their religious life. The nuns were not just mere victims of the Revolution overcome by circumstances. Each contemplated her martyrdom; each understood her offering. Each sought that “greater love” of giving herself for her fellow man in imitation of the Divine Lamb Who redeemed humanity. On July 12, 1794, the Carmelites were taken to Paris and five days later were sentenced to death. Before their execution they knelt and chanted the "Veni Creator", as at a profession, after which they all renewed aloud their baptismal and religious vows. They went to the guillotine singing the Salve Regina. They were beatified in 1906 by Pope St. Pius X. The Carmelites were: Marie Claude Brard; Madeleine Brideau, the subprior; Maire Croissy, grandniece of Colbert Marie Dufour; Marie Hanisset; Marie Meunier, a novice; Rose de Neufville Annette Pebras; Anne Piedcourt: Madeleine Lidoine, the prioress; Angelique Roussel; Catherine Soiron and Therese Soiron, both extern sisters, natives of Compiegne and blood sisters: Anne Mary Thouret; Marie Trezelle; and Eliza beth Verolot. 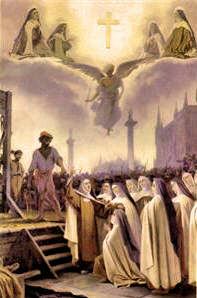 The martyrdom of the nuns was immortalized by the composer Francois Poulenc in his famous opera Dialogues des Carmelites. You can learn more about the Carmelite Martyrs in Gertrud von le Fort's historical novel, "Song at the Scaffold", William Bush's "To Quell the Terror", or go here and read Terrye Newkirk's excellent essay.